(Nanowerk News) Research from the University of Pennsylvania could shed light on the distribution of one of the most mysterious substances in the universe. In the 1970s, scientists noticed something strange about the motion of galaxies. All the matter at the edge of spiral galaxies was rotating just as fast as material in the inner part of the galaxy. But according to the laws of gravity, objects on the outskirts should be moving slower. The explanation: A form of matter called dark matter that does not directly interact with light. Many scientists now believe that more than 80 percent of the matter of the universe is locked away in mysterious, as yet undetected, particles of dark matter, which affect everything from how objects move within a galaxy to how galaxies and galaxy clusters clump together in the first place. This dark matter extends far beyond the reach of the furthest stars in the galaxy, forming what scientists call a dark matter halo. While stars within the galaxy all rotate in a neat, organized disk, these dark matter particles are like a swarm of bees, moving chaotically in random directions, which keeps them puffed up to balance the inward pull of gravity. An image of a simulated galaxy cluster showing evidence for a boundary, or "edge" from a 2015 paper in the Astrophysical Journal by Surhud More, Benedikt Diemer and Andre Kravtsov. Bhuvnesh Jain, a physics professor in Penn's School of Arts & Sciences, and postdoc Eric Baxter are conducting research that could give new insights into the structure of these halos. The researchers wanted to investigate whether these dark matter halos have an edge or boundary. "People have generally imagined a pretty smooth transition from the matter bound to the galaxy to the matter between galaxies, which is also gravitationally attracted to the galaxies and clusters," Jain said. "But theoretically, using computer simulations a few years ago, researchers at the University of Chicago showed that for galaxy clusters a sharp boundary is expected, providing a distinct transition that we should be able to see through a careful analysis of the data." Scientists believe that this region, or "edge" is due to the "splashback effect." "You have this big dark matter halo sitting there," Baxter said, "and it's been accreting matter gravitationally over its entire history. As that matter gets pulled in, it gets faster and faster. When it finally falls into the halo, it turns around and starts to orbit. That turnaround is what people have started calling splashback, because stuff is splashing back in some sense." As the matter "splashes back," it slows down. Because this effect is happening in many different directions, it leads to a buildup of matter right at the edge of the halo and a steep fall-off in the amount of matter right outside of that position. This is what the Penn researchers explored in the data. 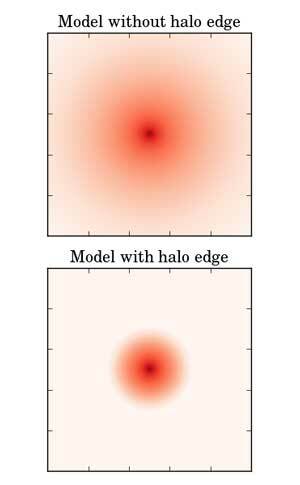 A two-dimensional comparison of two models for the density profile of a halo. Both of these models come from fitting to data in SDSS. Models with a splashback feature (an "edge") fit the data better than models that don't have an edge. New measurements provide evidence that this "edge" exists. Using a galaxy survey called the Sloan Digital Sky Survey, or SDSS, Baxter and Jain looked at the distribution of galaxies around clusters. They formed a team of experts at the University of Chicago and other institutions around the world to examine thousands of galaxy clusters. Using statistical tools to do a joint analysis of several million galaxies around them, they found a drop at the edge of the cluster. 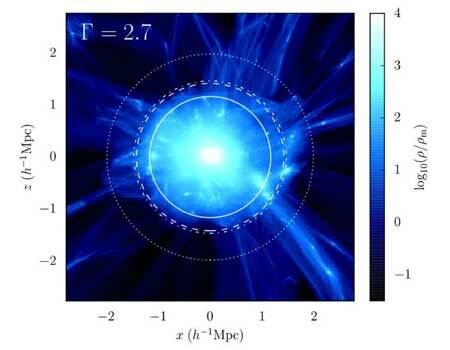 Baxter and collaborator Chihway Chang at the University of Chicago led a paper reporting the findings, accepted for publication in the Astrophysical Journal. In addition to seeing this edge when they looked at galaxy distribution, the researchers also saw evidence of it in the form of galaxy colors. When a galaxy is full of gas and forming many big, hot stars, the heat causes it to appear blue when scientists takes images of it. "But those big stars live very short lives," Baxter said. "They blow up. What you're left with are these smaller, older stars that live for long periods of time, and those are red." When scientists look at galaxies within clusters, they appear red because they aren't forming stars. "Previous studies have shown that there are interactions inside of the cluster that can cause galaxies to stop forming stars," Baxter said. "You could imagine for instance that a galaxy falls into a cluster, and the gas from the galaxy gets stripped off by gas within the cluster. After losing its gas, the galaxy will be unable to form many stars." Because of this, scientists expect that galaxies that have spent more time orbiting through a cluster will appear red, while galaxies that are just starting to fall in will appear blue. The researchers noticed a sudden shift in the colors of galaxies right at the boundary, providing them with more evidence that dark matter halos have an edge. "It was really interesting and surprising to see this sharp change in colors," Jain said, "because the change of galaxy colors is a very slow and complex process." The researchers are working on another paper using a deeper survey of over a hundred million galaxies called the Dark Energy Survey, or DES. Both the SDSS and the DES make massive maps of the sky using a huge camera that Jain said isn't very fundamentally different from the cameras in smartphones but bigger and more precise and costing millions of dollars to build. In the DES, when the camera opens, it takes an exposure of a couple minutes, and then moves to a different part of the sky. This process is repeated during the course of several years using different filters to allow scientists to get a survey in multiple colors. The DES allows the researchers to do expanded measurements, pushing to higher distances. Instead of measuring the distribution of galaxies, the researchers are using an astrophysical phenomenon called gravitational lensing to probe the dark matter halos. In gravitational lensing, light coming to an observer bends as matter exerts gravitational force on it. The researchers can analyze images of the sky to see how clusters stretch images of the galaxies behind them. "Light is going to bend if there's mass," Baxter said. "By measuring these deflections we can measure the mass directly which is cool because most of the mass is dark matter which we can't see so it's kind of a unique way to probe the dark matter." In terms of fundamental understanding of the universe, Baxter said, dark matter is one of the biggest mysteries there is right now. "You look in the sky, even with the biggest optical telescopes, and you see nothing beyond the light of the galaxies," Jain said. "There's just this dark matter." The researchers hope that their research will contribute to a better understanding of the mysterious substance that makes up about 80 percent of matter in the universe. If they can mark the edge of a dark matter halo, it would allow them to test things like Einstein's theory of gravity and the nature of dark matter. "It's just a new way of looking at clusters," Jain said. "Once you find the boundary you can study both the standard physics of how galaxies interact with the cluster and the possible unknown physics of what the nature of dark matter and gravity is."